Tankless water heaters are becoming a more popular choice for homeowners in Calgary. They are known for being more efficient and they are smaller in terms of size. Many people are starting to think that tankless is always better, but in some cases tankless is not the best way to go, and a hot water tank heater may be the better choice. We will walk you through the advantages of both hot water tank and tankless heaters and what one might be better for your home. Let’s start with tank water heaters and why one might be the right fit for your home. The first important benefit of hot water tanks is their price including installation. Hot water tanks can be purchased and installed for thousands of dollars less than a tankless model. 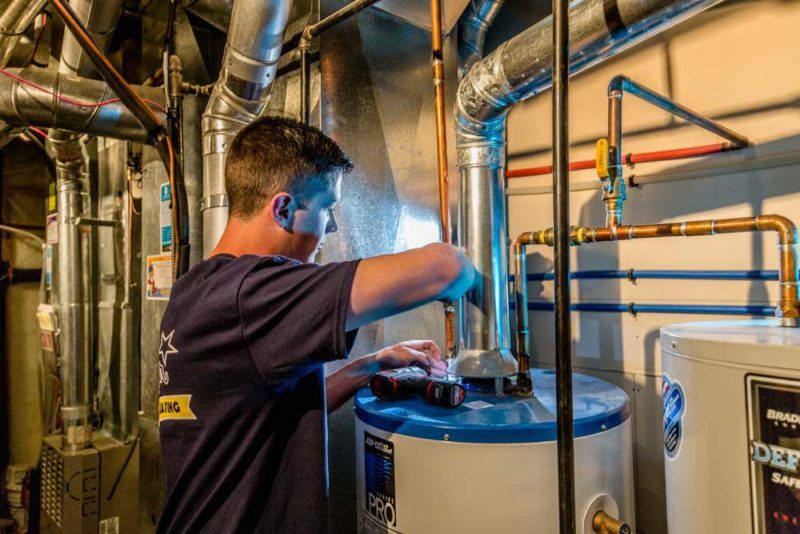 If your family is on a tight budget or is not looking to spend a lot of money on your next water heater than a tank heater is probably right for you. The average lifespan of a tank water heater can be from 10 to 15 years with some lasting beyond that. Tank water heaters generally hold between 150 to 300 liters of hot water in their storage tanks. They are usually fairly large and can take up a bit of room in your home. If you do end up using all the hot water in the storage tank then you will need to wait until your water heater produces more water. So how will you know if a tank water heater is right for your home? If you are on a tight timeline or a restricted budget then a tank water heater will work better for you. If you are looking to change from a tank heater to a tankless heater you have to factor in costs of adding new ventilation and additional gas lines in your home. This will be a lot more expensive than just upgrading your current tank water heater. Tank heaters are less efficient and will cost you more money over the long run, but the low upfront costs can sometimes outweigh the over time savings of a tankless water heater. Now let’s take a look at whether a tankless water heater is right for your home. The cost of a tankless water heater can vary dramatically based on the type, brand, your home and whether you are installing a new tankless heater or replacing an old one. Installation can be timely and expensive if new gas lines and ventilation need to be installed to accommodate your tankless water heater. Putting a tankless water heater in your home will likely be more expensive than a tank heater. On the plus side tankless water heaters are very durable and have a long lifespan, you can usually count on them to last you over 20 years. Tankless water heater systems heat your water on demand using gas or electric coils. This means unlike tank heaters with a tankless system you won’t have to worry about running out of hot water. However tankless water heaters do have output limits on their flow rate. This means if you’re simultaneously running your dishwasher, washing machine and taking a shower it may not be able to produce hot water fast enough. Gas tankless units typically heat water faster than electric ones. So is a tankless water heater right for your home? If you are building a new home or you can install a tankless unit without too much additional cost, then a tankless unit can be a great money saver. Also if you are willing to spend more money upfront for the convenience of a limitless hot water supply it would also work for you. Installing a tankless water heater is all about balancing the costs to you. Still not sure on whether you want a tank water heater or a tankless system? Then you should give the experts a call. The experienced and knowledgeable plumbers at Lone Star can provide you with the information you need to make the best decision for your home.